Somalia is a member of the Intergovernmental Authority on Development (IGAD), the African Union, the League of Arab States, the Organisation of Islamic Conference and the UN Assembly. Trade has grown steadily since 1991. Trade has no doubt benefited frsom the virtual dollarization of the economy. The structure of the economy remains similar to the pre-1991 period. 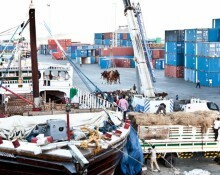 The Somalia Trade with African,Asia and far western countries International trade is the exchange of capital, goods, and services acrossinternational borders or territories.In most countries, such trade represents a significant share of gross domestic product (GDP). While international trade has been present throughout much of history (see Silk Road, Amber Road), its economic, social, and political importance has been on the rise in recent centuries.